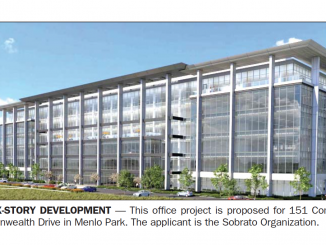 An illustration from the developer of the proposed office project for 2020 Bay Road in East Palo Alto. 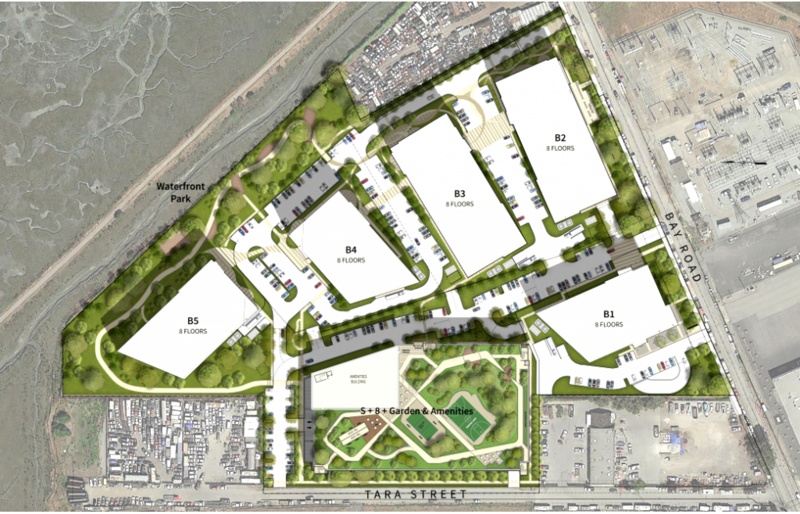 The East Palo Alto Planning Commission tonight (March 25) will scrutinize plans for a 1.4-million-square-foot office building campus at the end of Bay Road, not far from Cooley Landing. It would be the third-largest development proposed for the mid-Peninsula. 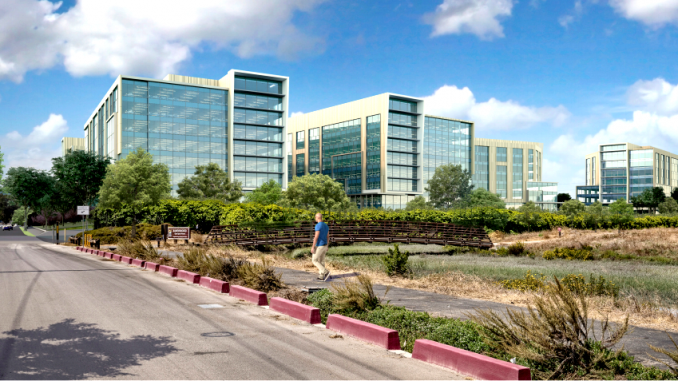 Facebook is proposing to build 1.7 million square feet for its Willow Road Village campus in Menlo Park. And Stanford is proposing to build 3.5 million square feet under a proposal submitted to Santa Clara County. The Bay Road campus would consist of five eight-story office buildings and one parking garage that would also have an “office amenities and high garden” space on the top floor, according to a report from city planner Ami Upadhyay. New York resident Bill Uhrig is listed as the owner for the project, according to Upadhyay’s report. 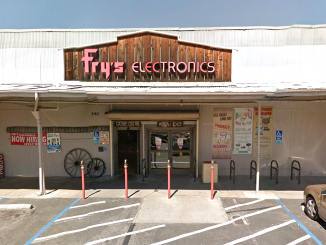 Plans call for one of the two buildings along Bay Road to have 3,500 square feet of retail on the ground floor. There will also be a “waterfront park” that will span the border between the project and the Baylands. The parking garage will have 4,328 parking spaces. City code requires for there to be 4,665 parking spaces. A site plan of the 2020 Bay Road development provided by the developer. Some of the site was on the former Romic Environmental Technologies hazardous waste management site, which closed in 2007. Contaminated soil on the site is currently being remediated so it will be less hazardous for employees. The remainder of the site used to be an auto body wreckage yard, according to Upadhyay’s report. The commission tonight will be asked to weigh in on the proposal, and since the project is bigger than what current zoning allows for, the commission can pitch ideas for what “public benefit” they would like to see the developer provide. Some potential benefits the city could see would be: housing, employment opportunities for residents, retail and other various upgrades for the town. The Bay Road developer joined the Sobrato Organization and Chan-Zuckerberg Initiative to give the city $4.5 million to buy a portion of Mountain View’s water supply to overcome a shortage in East Palo Alto that had halted development. The developer of this project chipped in $1.53 million while Chan Zuckerberg gave $2 million and Sobrato contributed $1 million. 4,665 parking spaces, they need to provide a “public benefit” of 4,665 NEW housing units within a reasonable commute. At 6-8 employees per 1000 sq feet which is common for open offices like Amazon and Facebook use, that would is space for 8400 to 11,000 workers. So transit, biking and walking would need to be used by at least 50% of the workers. It is walking distance to the planned Facebook Dunbarton Train right?